In 2013, there were an estimated 8.6 million women-owned businesses in the U.S. generating 1.3 trillion in revenue and providing jobs for nearly 8 million people. 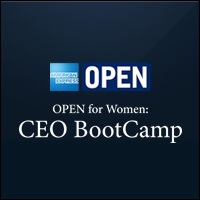 OPEN for Women recently launched their CEO BootCamp, intended to foster confidence, competence and connections among this growing community of women entrepreneurs. OPEN held an event in Los Angeles this week that was partially broadcast online, so we tuned in and thought we'd share the most poignant highlights from the video, applicable (and actionable) for any CEO out there! 1. Listen to what your clients want. This was actually a takeaway from the intro video, as well as the meat of the presentation. It's so important to be flexible and tune in to what your customers really want. The example in the intro was a natural, eco-friendly apothecary which pivoted to offer clients full-service skin care. How did the owner make that decision? Everyone kept asking if they could book facials. Simple as that. 2. Jump before you're ready. We loved this indirect tip from Alexis Maybank of Gilt, the hugely popular online sample sale that changed the retail industry. Gilt's first sale launched just four months after the founders started the company, before they even created the product returns page. It's never going to feel like the absolute perfect time to press GO, so why not start now? 3. Don't be afraid of the naysayers—learn from them. Having coffee with people who poke holes in your business plan are valuable. It helps you fill the gaps you might not've seen prior. And it helps you more confidently answer those hard questions when they come later from potential investors or customers. At the same time, maintain your focus and don't let them deflate you. 4. Build a strong human foundation. "It's human nature to hire people exactly like you, but that doesn't make for the strongest team," offered Maybank. You need people to push back, you need people to make the important lists, you need people to be creative and skilled in different ways than you are. No matter what, you need everybody who works for you to be flexible and understand that their role today won't be the same as tomorrow. 5. Connections are everything. Make introductions, take meetings, introduce yourself, be open and be generous. A supportive network starts with you and this was a common thread throughout all of the presentations and throughout CEO BootCamp itself. 6. Know when to let go. Denise Wilson of Desert Jet started her private plane charter company as a one-woman show, but in order to take her business to the next level, she need to get out of her own way, so to speak. She recognized that she had to let go of some of the minutia and be the CEO, not the pilot/mechanic/marketing manager/bookkeeper/etc. What are some of your biggest challenges as a female entrepreneur? Any tips you've learned along the way? Let us know in the comments!